Often when you have a big exam coming up the next day, it is a good idea to highlight the important points on your book. However, there are times when you get so absorbed in the book that you do not notice the highlighter stains on your hands and arms. If not that, there are times when your siblings or friends decide to play a prank on you while you are asleep at night, resulting in highlighter marks all over your face. When you wake up the next morning, you are likely to panic when getting late for school or office. Do not worry; removing highlighter stains from skin is a short and easy process. 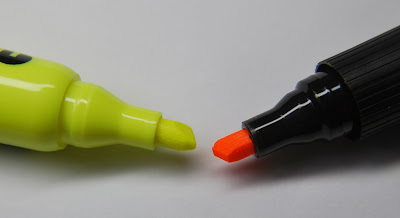 Although most highlighter marks get removed by simple soap and water, some that have been left in place for a longer period of time may not get removed by soap and water. This article provides you with methods that you can use to get rid of the highlighter stains on your skin. 1. Firstly, gather all the things stated above before you start cleaning the highlighter marks from your skin. 2. Now, apply some nail polish remover containing acetone on a cotton ball or tissue paper. 3. Rub the cotton ball or tissue paper over the stained area on your skin. 4. Once the cotton ball or tissue paper has dried, grab another one, and repeat the above steps. Do so till all the highlighter stain has been removed from your skin. 5. Now, wash your skin as normal with a hand wash or body wash.
6. Apply lotion to the stained area to restore the moisture of the skin. 1. If you have been unable to remove the highlighter stains on your arms and face by standing under the shower for ten minutes or by using a mild soap, try using rubbing alcohol on the stained area to get rid of the marks. 2. Apply as much rubbing alcohol as required to a cotton ball or tissue paper. If the stain is large, you may also apply rubbing alcohol to a white, clean cloth that is larger in size. 3. Rub the cotton ball or the clean cloth over the stained area. 4. Saturate another cotton ball once the previous one has dried. Repeat the above steps till the stain is visible no more. 5. Wash your skin as normal using a hand wash or body wash.
6. To restore the moisture to the skin, apply lotion to the stained area.